Some of you may have heard my story of how I won an iPad last summer while attending the Read Write Web Real-Time Web Summit. But many of you have not. It came up at dinner last night, and I thought it was finally deserving of a blog post of its own. Man, that was quite a week. First, I won tickets to the one-day conference, hosted in New York City. (The conference was outstanding; you can read a recap on my professional blog.) While there, they announced they would be giving away six iPads over the course of the day. At lunch, they gave away four by random drawing. The last two, they said, would be given out at the closing session to whomever created the best rap or poem. Yes, rap or poem. So, for the rest of the afternoon, I scribbled verses on a scrap of paper, muttering rhymes and rhythms under my breath. By the time the closing session began, I was as ready as I would ever be. Luckily, I was sitting next to my higher ed partner in crime, J.D. Ross, whom I was happy to have around for reassurance. Real-time web, you know we make it rain! See that scrollbar area with the tweets? That was updating in real-time, with newer tweets showing up dynamically and pushing down the later ones. Heck, it even has a pause button. 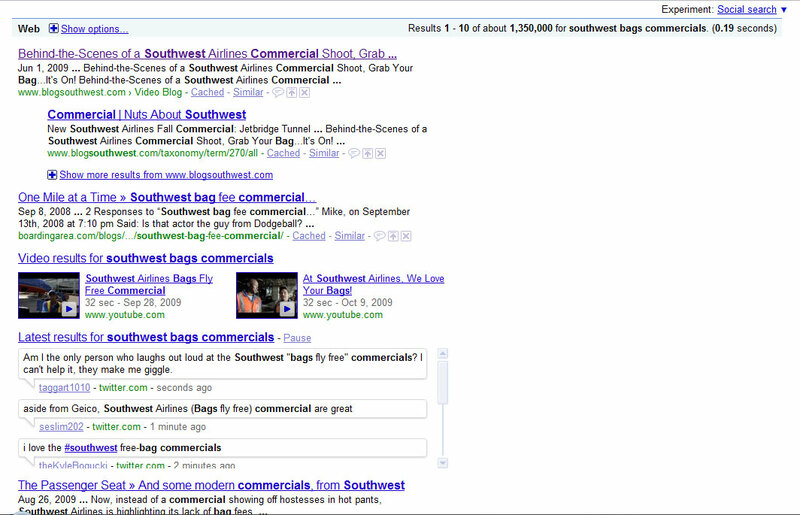 It was surprising to see my Google search results updating themselves before my eyes, but also really cool. Right away, I felt part of a shared, immediate experience. (I felt the same way when I was trying to find out the name of the song in this State Farm commercial, and as I typed, I watched Google auto-complete my query: “state farm commercial guy in car singing.” Eerie.) Others had watched the commercial at the same time I had and felt compelled, in one way or another, to bring their experience to the web. But while it was a new and exciting dimension to my Google searching, it wasn’t specifically relevant to my query. I decided to do an experiment of my own and try some other topical searches. Google queries for “iran protests,” “health care reform” and “florida cold” yielded no real-time results. Googling “jay leno” and “harry reid” and “green bay packers” (the football game on at that moment) brought up a real-time stream that began with several news and blog sites, shifted to some tweets and then went back to web links (though the Packers search query yielded all tweets in the real-time feed). It makes sense that the real-time stream comes into play most prominently for events happening in, well, real-time. Topics like my first three searches will still carry the same level of relevance in 8 hours; the Packers game will not. Breaking news has always captivated me since my first job at Boston.com, and living in a real-time web world — not just Google; think about Wikipedia during a developing story — only enhances the breaking news experience. But it’s about more than news. Everything is a breaking story. Everything is ongoing and developing. All the angles are out there on the web, and Google is putting itself in the role of aggregator. The early results are promising, but they label their endeavor properly: an experiment, still a bit rough around the edges.